This was the beginning of a new website for Kooj, in early stages. The archive website for Kooj is www.kooj.net , however Kooj’s work as an artist is now being integrated into the website for Metaceptive Projects and Media – his creative company: www.metaceptive.net . Please visit that site instead, or bear with the possibility that this site becomes fully functional sometime, thanks! Resonance uses visually poetic metaphors combined with testimonial narratives to create a statement linking migrant settlers in Britain with the colonial and industrial legacy that brought them here, and with contemporary experiences and creative developments. The work interactively focuses on understanding the migrant experience within the framework of global economy and centralisation of wealth, and draws on the daily lives and personal struggles of the respective communities. As an installation, Resonance combines video screens with projected digital interactive multimedia, along with an original 3-dimensional soundtrack. It integrates layers of documentary video, interviews, graphics, animations and computer games, so allowing the viewer to navigate through a variety of environments exploring the contrasts and resonances between migrant settlers. Using digital montage, visual symbolism and creative video, with the support of the original soundtrack, contrasting notions of alienation and integration are continually explored without ever losing the sense of a wider contradiction. Migrant experiences come together in an alternative history of cotton-spinning, which was the base of the industrial revolution and whose mills played a major part in the recruitment of migrant labour. The struggle for a pluralist identity is a metaphoric mirror-piece to the more linear and historic narrative, and provides interactivity with a range of dialectical expression. Over 40 interviews spanning Afro-Caribbean, Bangladeshi, Indian, Irish, Pakistani, Polish and Ukrainian communities contribute to and enrich the work, which focuses on the Oldham area of Greater Manchester, historically acknowledged as the pioneering global centre of cotton spinning. The video and digital media artist Kooj Chuhan has exhibited at various film and media festivals and gallery spaces across Britain over the past seven years. In addition to productions and commissions he also works with colleges and community groups and regularly conducts lectures, presentations and discussions on related subjects. Also available as a single-screen CD-ROM installation. First commissioned by and shown at Oldham Art Gallery, January-July 1999. Game programming by Claudine Moutou. 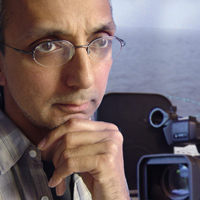 Arun Kundnani, producer of the award-winning ‘Homebeats’ CD-ROM, Institute of Race Relations, UK. Alnoor Mitha, SHISHA (South Asian Crafts and Visual Arts Network, UK). How does the legal work of the GMIAU (Greater Manchester Immigration Aid Unit) help refugees to rebuild their lives? What motivates the caseworkers? How do refugees respond to the challenges that the asylum system throws at them? This exhibition is a celebration of the work that caseworkers do and a testament to the courage of refugees and people seeking asylum. 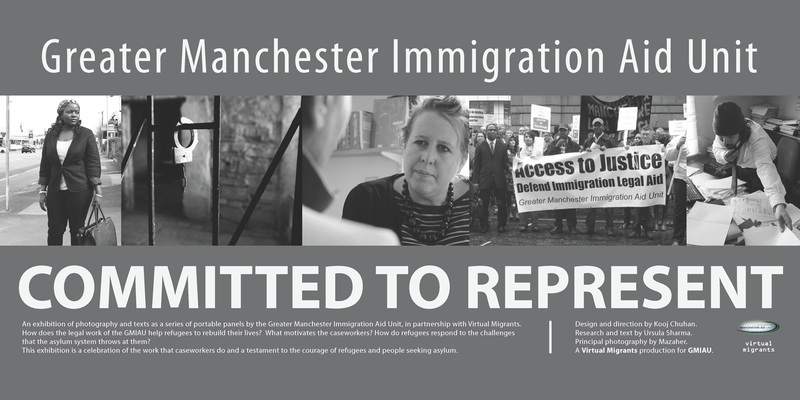 It consists of photography and texts as a series of 12 portable panels by the Greater Manchester Immigration Aid Unit and Virtual Migrants. A special talk about the Committed To Represent exhibition by Denise McDowell (the director of GMIAU) will take place on Wednesday 2nd April at 6.20pm, before the performance at 7pm. This exhibition is available for borrowing or hire (if you have available funds), and a speaker can be provided if desired. The panels can be set up to accompany any relevant event or activity involving an audience, or cultural / artistic programme. Please contact virtual migrants via www.virtualmigrants.net or contact GMIAU directly via www.gmiau.org . More information along with previews of the exhibition are available at http://virtualmigrants.net/committedtorepresent . Design and direction by Kooj Chuhan. Research and text by Ursula Sharma. Photography by Mazaher. Includes the video art installation “Fear And Liberation” (printed PVC banners with video screen). “Infusion” is a process which releases active ingredients, liberating the vital essence of a substance into the surrounding area. This work integrates critical art practice exploring collective identities with community collaboration, created by an artist with over 25 years of work in community, migrant and activist contexts. Artist Kooj Chuhan, originally commissioned by Community Arts North West (CAN), used cultural, media and performance methods to work with young people in Wigan and Leigh from countries such as Ghana, Iraq, Nigeria, Zimbabwe, Cameroon, Guinea or DR Congo, and Roma areas such as Slovakia or the Czech Republic. A community performance with the title “Fusion” gave a platform for their expressions and was filmed and two members of Rafiki, Joe and Raphael, then worked with Kooj on his own project to create the “Fear and Liberation” installation. Thinking around migrant youth issues, Joe and Raphael immediately suggested a key quote from the biographical film Coach Carter which expressed some of their feelings about the needs of young black men. This art installation uses words based on the concluding line which becomes a window through which we see a montage of video imagery, the young people in performance, hanging out, in alternative roles and shots of Wigan, with words they have written during workshops with Levi Tafari and MC Crystalize. The two walls either side of this installation present complementary video work comprising firstly a projection of two drama films made by Rafiki with Kooj titled “Classifique FM” and “Dress Your Heart Out”, and secondly a smaller screen plays the montage film “F-Review” which contrasts cultural activities against global contexts for the young people. The final wall presents “Landing”, an installation consisting of prints in frames or on the wall along with hanging clothing. This was produced during a gallery workshop where a range of young people brought in objects or photographs and located images from the internet, which they felt represented something of their cultural origin relevant to them now. They printed these off and generated a wall design from which Kooj created the final installation, a snapshot of a collective self-portrayal. This room itself becomes another installation as an environment which the gallery visitors can inhabit, titled “Infusion”.